Do robotic geckos dream of rainbow life on Mars? Posted in: BSU Physics Seminar. Tagged: extremophiles, Mars. Today, in physics, we hosted Prof. Nancy Chanover of New Mexico State Astronomy for our departmental seminar. Chanover gave a fascinating talk on her work developing acousto-optical tunable filters (AOTFs) to look for life in exotic terrestrial environments and on Mars. AOTFs involve the application of an oscillating radio signal to a birefringent crystal. By applying the right frequency to the crystal, the crystal can be made to filter out light of very specific colors. Measuring the filtered light that comes out allows one to measure the colors of a object — is there more red light that filters through than blue, for instance? One big advantage of these AOTFs is that they can produce spectra of rocks, minerals, anything that is colored, without any moving parts, and no moving parts is a big plus when you send an instrument to another planet. In her talk, Prof. Chanover discussed her group’s work to develop AOTFs and techniques to analyze the emergent spectra and identify minerals on planets or moons in our solar system. Different minerals can have distinctive colors, and so taking the spectrum of a Mars rock, say, could allow us to identify its composition, without having to vaporize the rock to chemically analyze it. The same technique could be used to look for Martian life. 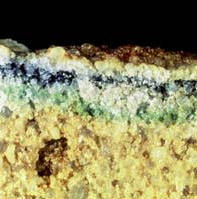 In some cases, extremophiles on the Earth leave tell-tale coloration in rocks (see figure at left), and so Martian life (if it exists) might do the same. Prof. Chanover’s group is looking for the distinctive spectral signatures of terrestrial biota in hopes of sending an AOTF to Mars and looking for life there, particularly in caves, which might be especially hospitable for life. As a precursor to exploration of Martian caves, Chanover discussed her work attaching an AOTF to a robot developed by the Jet Propulsion Lab that climbs walls using footpads inspired by geckos, a LEMUR. This project involved several unforeseen challenges — as she said, on one trip, she struggled to say “acousto-optical tunable filter” in Spanish to a dubious Mexican border guard on the way to a field site in Mexico. The life of a planetary scientist.